What do people not see when they’re looking for a business like yours? 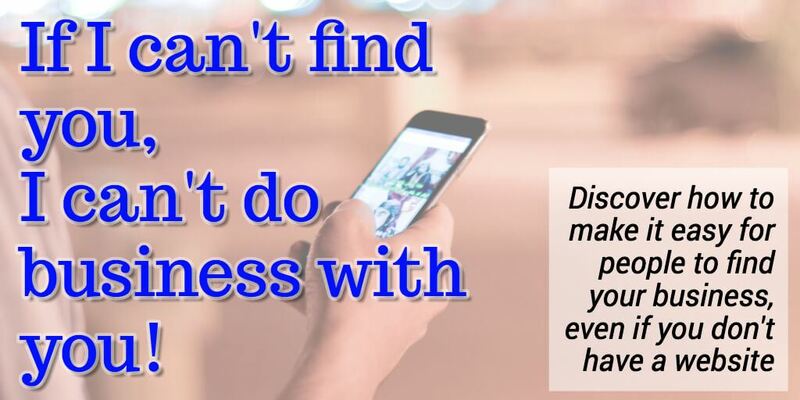 · Local Search · What do people not see when they’re looking for a business like yours? If you’re anywhere near Meeniyan on Thursday evening, the 16th of March, you’ll be able to find out! I’m speaking at the Meeniyan Town Hall, giving a presentation for the Southern Business Womens Network. If you’re thinking this is about websites, this evening is about a much bigger picture where websites are only one part. You used to rely on the Yellow Pages as a source of new customers, and a way to make it easy for existing customers to contact you. Now most of your potential customers carry “the yellow book” in their handbag or pocket – a mobile phone. While the local papers and what’s left of the Yellow Pages™ is still a good way to get customers, it’s not enough. Research shows people “look you up” before they call or visit. This happens if they have never heard of you, and it happens EVEN IF their friends or family said you were good. I’ll explain how to shine a spotlight on your business so you can be found when people are searching for a business like yours. I’ll boil the huge range of options out there, down to the most essential. There will be some “get real” moments where I bust myths and hype you’re used to hearing from SEO agencies, digital marketing agencies or website designers. In short, you’ll get a roadmap for building your visibility at a pace and rate you can afford. This is an interactive session so if you can, bring a device that will let you do a couple of quick things online. A mobile phone with a little bit of data plan is enough. If that’s not an option for you now, come anyway and someone will share with you. And bring a question or two!